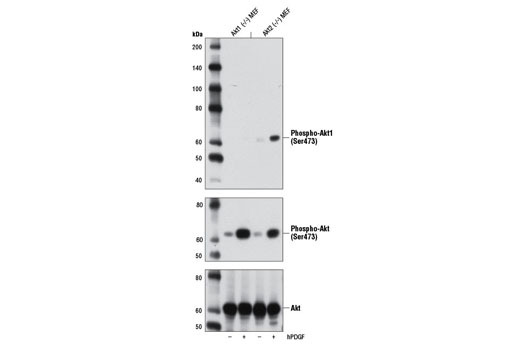 Western blot analysis of extracts from LNCaP cells, transfected with a construct expressing Akt1 shRNA or Akt2 shRNA, uninduced (-) or doxycycline-induced for the indicated times, using Phospho-Akt1 (Ser473) (D7F10) XP® Rabbit mAb (Akt1 Specific) (top), Phospho-Akt2 (Ser474) (D3H2) Rabbit mAb (Akt2 Specific) #8599 (2nd from top), Akt1 (C73H10) Rabbit mAb #2938 (middle), Akt2 (D6G4) Rabbit mAb #3063 (2nd from bottom), or PI3 Kinase p85 (19H8) Rabbit mAb #4257 (bottom). (Data kindly provided by Drs. Rebecca Chin and Alex Toker, Beth Israel Deaconess Medical Center and Harvard Medical School, Boston, MA). 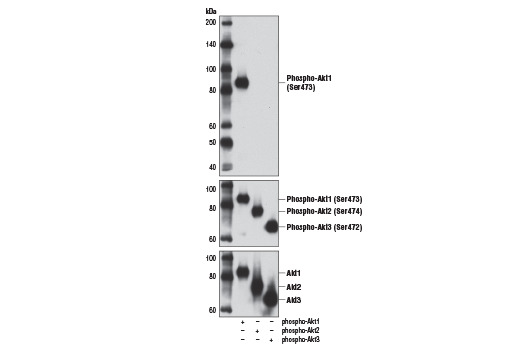 Western blot analysis of purified recombinant phospho-Akt1, phospho-Akt2 and phospho-Akt3 proteins using Phospho-Akt1 (Ser473) (D7F10) XP® Rabbit mAb (Akt1 Specific) (upper), Phospho-Akt (Ser473) (D9E) XP® Rabbit mAb #4060 (middle) and Akt (pan) (C67E7) Rabbit mAb #4691 (lower). Western blot analysis of extracts from Akt1 (-/-) mouse embryonic fibroblast (MEF) or Akt2 (-/-) MEF, untreated or stimulated with hPDGF #8913 (100 ng/ml, 15 min), using Phospho-Akt1 (Ser473) (D7F10) XP® Rabbit mAb (Akt1 Specific) (upper), Phospho-Akt (Ser473) (D9E) XP® Rabbit mAb #4060 (middle), or Akt (pan) (C67E7) Rabbit mAb #4691 (lower). Confocal immunofluorescent analysis of Akt1 (-/-) mouse embryonic fibroblast (MEF) (left column), or Akt2 (-/-) MEF (right column) cells, stimulated with hPDGF #8913 (100 ng/ml, 15 min) (top row) or inhibited with LY294002 #9901 (bottom row), using Phospho-Akt1 (Ser473) (D7F10) XP® Rabbit mAb (Akt1 Specific) (green). Actin filaments were labeled with DY-554 phalloidin (red). Blue pseudocolor = DRAQ5® #4084 (fluorescent DNA dye). Flow cytometric analysis of Akt1 (-/-) mouse embryonic fibroblast (MEF) cells (blue) or Akt2 (-/-) MEF cells (green), PDGF-treated (100 ng/mL, 15 min), using Phospho-Akt1 (Ser473) (D7F10) XP® Rabbit mAb (Akt1 Specific). Anti-rabbit IgG (H+L), F(ab')2 Fragment (Alexa Fluor® 488 Conjugate) #4412 was used as a secondary Ab. 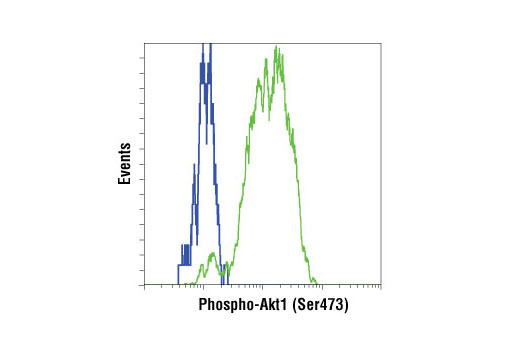 Phospho-Akt1 (Ser473) (D7F10) XP® Rabbit mAb (Akt1 Specific) recognizes endogenous levels of Akt1 protein only when phosphorylated at Ser473. 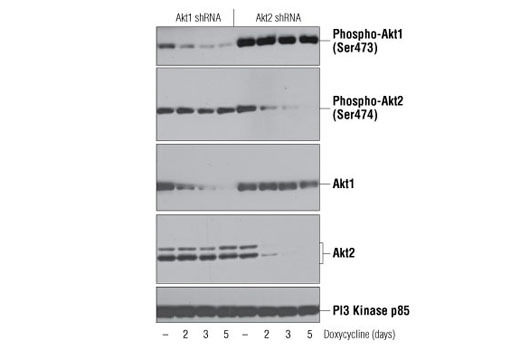 It does not detect Akt2 protein when phosphorylated at Ser474. 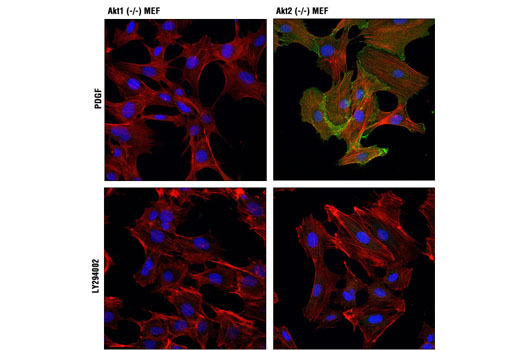 Monoclonal antibody is produced by immunizing animals with a synthetic phosphopeptide corresponding to residues surrounding Ser473 of human Akt1 protein.